This is NYC's only SAT-Prep Tour given by a former Stanley Kaplan Verbal PSAT Instructor and Tutor. Great for the pre-SAT and Back-To-School season. The ancient Greeks believed that the best way to learn was to walk and talk with one's instructors. That is where PEDagogy and PEDantic and PODiatry come from, like following the feet (of the professor). 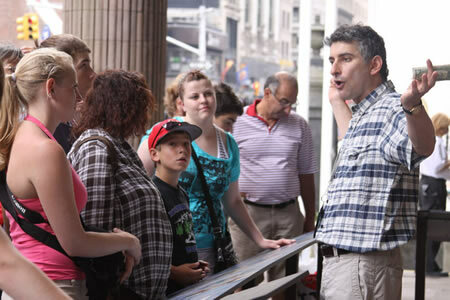 On these tours we will boost your high school student's vocabulary in a fun, interesting, memorable way. 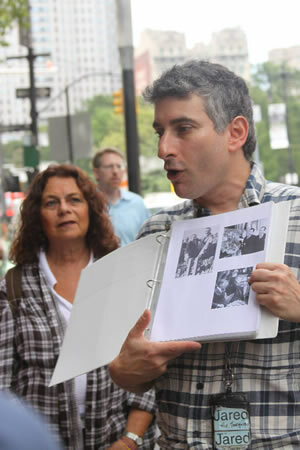 Not only will a Vocabulary Building Walking Tour increase your child's vocabulary, but those new words will increase your child's chances of success on the Verbal SAT section through increased knowledge and confidence. Many of us are visual and aural hearing learners. Vocabulary Tours involve hearing, seeing, questioning, physically writing (muscle memory), associations, and context. These are the ingredients for powerful memory building. Were that learning were always so fun and effective. Statisticians and pundits say that a college education alone doesn't guarantee success but having one combined with a good vocabulary can be worth millions of dollars in lifetime earnings. I give your family or your youth a tour from my list of Destinations and I lard the tour up chockablock with big words that we go over, each of which is then transferred to an index card with the definition and a sentence that is easy to remember. My goal: 60 new words for your youth to take along in two hours. To book a tour please fill out our Book Your Tour form and reference which tour(s) you would ike from our destinations page and also reference "Vocabulary Tours". Alternately you may call Jared at (917) 533-1057.